While being able to send WOL packets to computers before software deployments, Configmgr 2012 lacks a built in scheduled task for waking computers at a specific time. A work around I am using is a "do nothing" package scheduled to run once a week. 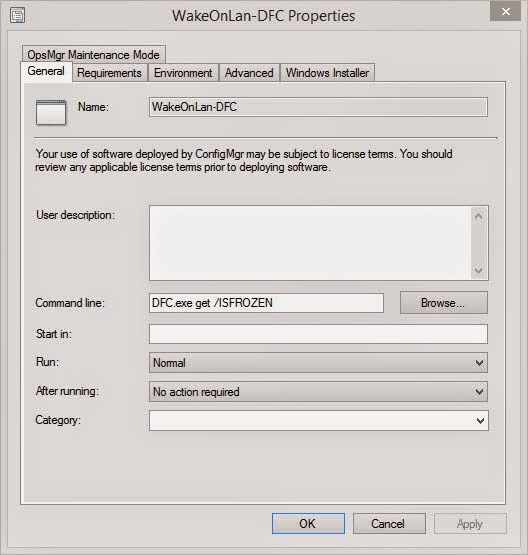 The deployment for this package is set to run outside maintenance windows, to ensure the computers are wakened and ready by the time both Deep Freeze and later Configmgr are ready to put them into thawed mode and the maintenance window. See this post for how the maintenance window timeline works at our university. Now on the deployment for this package, its important to check the Send wake-up packets checkbox on the Deployment Settings tab. Here I have it scheduled to run every week on Friday at 2:15AM. I have set the Rerun behavior to Always rerun program.